1. Order, buy, or borrow the appointed book. 2. After reading the book, cook up something delicious inspired by this novel and blog about it. If you don’t have a blog, one of us three hosts above would be happy to post your entry as a guest blogger. Make sure to include a link to this COOK THE BOOKS blog so others can find out about the details. 4. This round of COOK THE BOOKS will run until September 24, 2012. We are currently reading Laurie Colwin’s book “Home Cooking”. 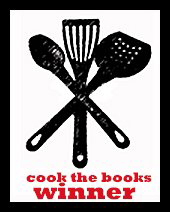 The winner will receive a fabulous badge to place on their blog and will be added to our Cook the Books Winners blog roll. Please feel free to join us by submitting your post! It’s a childrens’ book, but none the worse for that – A Little White Horse, by Elizabeth Goudge is a lovely fairytale with magic food in it! theres a book called the last Chinese Chef that I haven’t read but looked sort of interesting. have you ever heard of sour sweet by timothy mo? a chinese man living in london operates a restaurant with his wife = he has some shady dealings with the triads (chinese mafia)… maybe not too male freindly?!? This sounds like so much fun. I am so excited to participate in this event next time! When will the new event/book etc. be posted? Deb, Johanna and I are going to announce the next book after our December 15 deadline for Cook the Books entries about La Cucina, so stay tuned! Hello – Could I join your bookclub? I realize I would be starting the book late but I’m willing. And I like to cook! Yes, how does one join the group? I know it’s too late this time, but next time I would love to particiapte. What a fabulous creation. I am so excited. I feel like cooking is just as much a form of art as any painting, writing or music. We all need muses. Look forward to reading The Little White Horse. Who doesn’t love a book with a Unicorn on it? I just finished Kitchen Confidential, a little late I know! A great one for cook the books would be Molly Wizenberg’s “A Homemade Life” written by a fellow blogger. I just started the book and it is beautiful! Also there are a ton of recipes that we could all make. I SO want in. Please let me know how to sign up! Thanks! Please do join us. There is no admissions requirement other than grabbing a copy of the current book (currently Peter Mayle’s “French Lessons: Adventures with Knife, Fork and Corkscrew”), blogging about it and cooking up something inspired by your reading. Then we do a roundup after the deadline (currently Nov. 8) and our guest judge decides a winner who receives a badge for their blog and a listing in our blogroll. But there is no closed circle here, we welcome you and anyone else to join us every other month to blog about our selected book. Looking forward to seeing what you cook up! I’ve picked up my copy of A Taste for Adventure and will look forward to posting about my selection from it. Is there a list of previous selections that I could review? I would love to see what has already been covered. Hi there! I just got my post up for French Lessons! I linked back here, but I didn’t know if you wanted to add me to the blogroll, or if I needed to link up here as well somehow. Check it out! I love this idea as reading and cooking are two of my greatest passions! I look forward to joining you. To do so, I just post to my blog and link back to this site, is that correct? …I have so many more on my list…some which I’ve already read, some which I mean to…just wanted to throw some in the pot 😉 Thanks! I’ve just stumbled across your site and have already downloaded my copy of Lunch In Paris. Can’t wait to start! I’ve also emailed my BFF and told her to grab a copy too! I love this idea! I have been looking for a book club that focuses on books dealing with food, and will definitely be joining you! By the way, I saw this book today that sounds beautiful…and delicious. It is called Friendship Bread by Darien Gee. Sounds great! I’m reading The Particular Sadness of Lemon Cake by Aimee Bender right now. I think it would be a good choice. I’d suggest “White Truffles in Winter” by N.M. Kelby. Heard about it from the author on Twitter, got it as an Xmas gift, and read it immediately – imagine Escoffier, Paris, London, Monte Carlo…and dear me, the food descriptions made me hungry just reading.